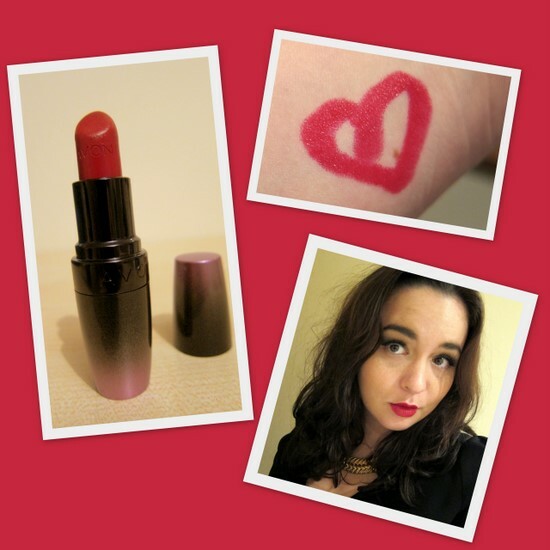 Avon Ultra Colour Rich Colordisiac Lipstick in Ravishing Red: Pictures, Review and Swatches! I really love red lipstick and I own some great varieties, ranging from Tom Ford to Rimmel and lots in between. But much as I love them I'm never entirely comfortable wearing them for a full day or evening: they're all high maintenance, and I fret about them fading irregularly, looking patchy, yellowing/smudging on my teeth or drying out my lips. Since this little lovely was sent to me, those worries are a thing of the past. I've written about this range before and I find them so easy and comfortable to wear: the formulation is creamy and moisturising and the colours are highly pigmented, so they stick around for a long time and when they do eventually fade, they do so evenly and leave a nice stain. They're just a really nice product. This particular shade will suit most colouring -- it's the one Reese is wearing in the campaign imagery, and is a lovely deep red that's as easy and appropriate to wear to the office as it is on a big night out. I'm so pleased I've found it; at last, a low maintenance, reliable red! Avon Colordisiac lipsticks come in at €12.75 and are available exclusively through independent sales representatives; you can find yours here. Do you like red lippie and what's your go-to, tried and trusted product? That colour looks amazing on you!!! This is gorge, looks great! I may be indulging... although possibly after Christmas, as right now I'm as poor as anything! I love red lipstick! I always wear Maybelline Very Cherry. The best! The colour is fab on you. I have to get some of these lippies, must place an order after Christmas. Thanks to your last post on red lipstick I gathered enough courage to go out and buy my first one!! I'm going to a wedding after Christmas and wearing an amazing red dress, so thanks for helping be brave enough to try out red lippie! My 7yo could starve before I'd go without lippy. Ahem, did you know lipstick was one of the few (if only) cosmetics not rationed in the UK during WWII? It was considered way too important as a moral booster. Will definitely try out this one - the price is right - so nose bags for the 7yo are safe for the forseeable. Cheers guys, let mr know how you get on if you do pick up some of the Colordisiac range. Red lipstic really suits you Emma!